So what’s with the name? Accounts vary, but some local historians point to the early 19th century, before much of the North Side was incorporated into Chicago, when area residents kept goats (the male goat is a buck). Goats no longer roam the streets of Bucktown, but if you’re looking for a new pair of shoes or a night on the town, it’s a good place to spend some bucks. To many, Bucktown is inseparable from its artier neighbor to the south, Wicker Park, which is better known beyond the boundaries of the neighborhood. Both ‘hoods are fashionable and hip, while retaining a somewhat gritty and rough-around-the-edges urban character. Bucktown residents have a mix of public and private schools to choose from. For elementary school, parents can choose from the Burr Elementary magnet clusterschool and Drummond Elementary. For high school, a K-12 branch of the Chicago International Charter School is located on Hamilton Avenue in Bucktown. Private school options include Josephinum Academy Catholic, a private middle school for girls, and St. Mary of the Angels, a K-8 Catholic school. Bucktown and neighboring Wicker Park are served by an active chamber of commerce as well as WPB, a community organization that promotes the arts and commerce in both neighborhoods. The densely populated neighborhood features a pair of small public parks – Holstein and Senior Citizen Memorial – that are ideal for dog walking. In the summer, locals flock to Wicker Park’s namesake four-acre park on Damen Avenue to soak in some sunrays. Bucktown is also home to one of Chicago’s premier branch libraries, located at the intersection of North Milwaukee Avenue and West Wabansia Avenue. The large, two-story library was completed in 2006, replacing a pair of smaller storefront branches in the community. Since 1990, home values in Bucktown have risen as fast as any urban neighborhood in the nation. Today, the neighborhood features an eclectic mix of stately 100-year-old brownstones and graystones, converted industrial lofts, modernist mansions, and modest six-flats. New construction flourished as Bucktown became boomtown through most of the 2000s. Most of the new condo developments and townhouses have a distinctly modern design, and new homes range from the unpretentious brick walkups to ostentatious single-family homes. Although it is still possible to find a home in Bucktown for less than $500,000, more and more million-dollar homes are hitting the market. The Kennedy Expressway serves as the eastern boundary of Bucktown, and a less than five-minute drive on the expressway will take you to downtown Chicago. In the warmer months, many Bucktown residents opt to commute using two wheels, taking the bike lane on Milwaukee Avenue for the 2.5-mile ride downtown. 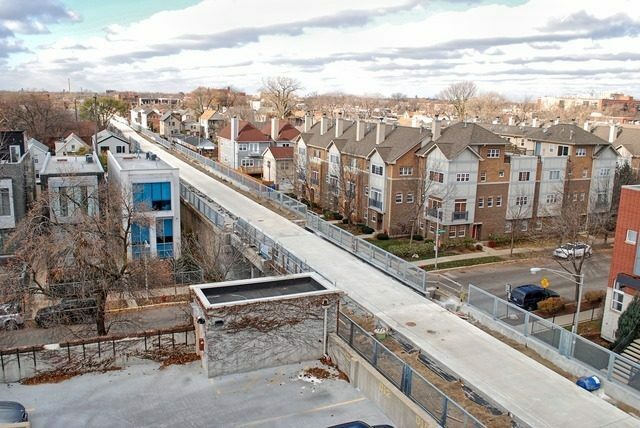 The metal-on-metal clanking of the elevated train tracks can be heard from most points in Bucktown. That’s because the O’Hare branch of the CTA Blue Line, which makes stops at Damen and Western avenues, also serves Bucktown. On a typical day, the Blue Line takes about 20 minutes to reach The Loop and 30 to 40 minutes to reach O’Hare Airport from Bucktown. Fine dining? Check. Hipster hangouts? No problem. How about a nightcap? Bucktown has you more than covered. For a high-end meal in cozy surroundings, take your date to Hot Chocolate, where chef-owner Mindy Segal serves up sweet treats and cutting edge interpretations of American classics. If that doesn’t satisfy your sweet tooth, order up a hot fudge sundae at Margie’s Candiesand savor the nostalgia. Hipsters flock to Irazu, a Costa Rican restaurant that’s known for being easy on the taste buds and the wallet. The Map Room is where beer aficionados tip back local microbrews and exotic beers from around the world. Marc Jacobs recently opened a 4,000 square-foot storefront on Damen Avenue, which should give an idea what direction retail is headed in Bucktown. Another popular destination is Akira, which originated as a shoe store, and has opened several different storefronts on North Avenue offering men’s and women’s apparel.